The Law Library of Victoria values the privacy of every individual's personal information. Protecting your privacy and your personal information is an important aspect of the way we conduct our business. The Act is designed to protect all information held by the Victorian public sector, including the personal information of individuals. The Office of the Victorian Information Commissioner's mission is to safeguard Victorians’ information and support information innovation. Under the Act, 'personal information' is any information about an individual who is identified by or is identifiable from the information. This statement outlining how we use ‘personal information’ is informed and guided by the Office of the Victorian Information Commissioner’s Information Privacy Principles, set out below. Unless stated otherwise, the Copyright © of all material on this site is held by the Law Library of Victoria. Reproduction or reuse of this material for commercial purposes is forbidden without written permission. The contents of this website are intended for informational purposes only. The Law Library of Victoria shall in no event accept any liability for loss or damage suffered by any person or body due to information provided on this site or linked sites. The Library is not providing advice by or through the making available of information through this site. The information on the Law Library of Victoria website is provided on the basis that persons accessing the website undertake responsibility for assessing the relevance and accuracy of its content. Links to other websites are inserted for convenience and does not constitute endorsement of any material that may be at those sites; nor does it constitute an endorsement of any associated organisation, product or service. We respect our customers and their privacy. Personal information is any data that can be used to identify an individual, such as email addresses, mailing addresses, location data, or a user’s first and last name. The Law Library of Victoria will only collect personal information from you with your prior knowledge and consent. We will only use personal information provided by you for the purposes for which it was collected. This information will be collected with your knowledge and participation. Your personal information will never be shared or sold for commercial purposes. We ensure that your personal information will not be disclosed to other State institutions and authorities, except where required by law or other regulation. 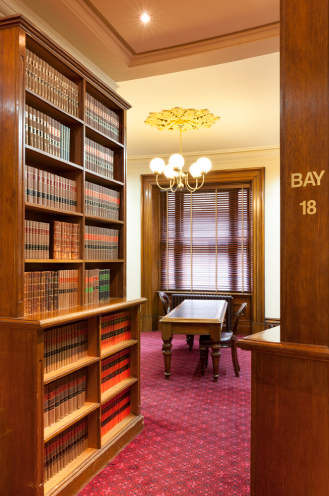 The Law Library of Victoria has implemented technology and security policies, rules and measures to protect the personal information that it has under its control from: unauthorised access, improper use, alteration, unlawful or accidental destruction and accidental loss. When personal information is no longer needed for the purpose it was collected, that information will be destroyed in a reasonable manner (except where archiving is required). You can access our website home page and browse its site without disclosing personal information. How users personal information will be used by the Law Library of Victoria. We collect your email address to send information you have subscribed to, namely the "Library Events Mailing List” and/or “Library electronic newsletter" or “The Law Libary of Victoria Bulletin". We will never knowingly send you unsolicited commercial electronic messages. How users can modify or delete personal information held by the Law Library of Victoria. You can modify or delete your personal information by emailing a request to llv@courts.vic.gov.au. How users can opt-out of future communications from the Law Library of Victoria. You can unsubscribe to any of our mailing lists by emailing llv@courts.vic.gov.au. The Information Privacy Principles are available here. A publication is available titled the "Guidelines to the Information Privacy Principles". The Privacy and Data Protection Act 2014 (Vic) (PDPA) establishes Information Privacy Principles (IPPs) which inform and guide the Law Library of Victoria in the collection and handling of certain personal information. Your personal information can only be used and disclosed for the primary purpose for which it was collected, for a secondary purpose that you would reasonably expect or in other limited circumstances. It is best that the organisation gets your consent, but the law allows some uses without consent, such as law enforcement purposes and to protect safety. Organisations must keep your personal information accurate, complete and up to date. Your personal information must be protected from misuse, loss, unauthorised access, modification or disclosure. An organisation must take reasonable steps to destroy or permanently de-identify your personal information when it is no longer needed. You have a right to seek access to your own personal information and to make corrections if necessary. An organisation may only refuse in limited circumstances that are detailed in the PDPA, for example where disclosure might threaten someone’s safety. Unique identifiers, usually a number, can facilitate data matching. Use of unique identifiers is only allowed where an organisation can demonstrate that the assignment is necessary to carry out its functions efficiently. There are also restrictions that are detailed in the PDPA on how organisations use unique identifiers assigned by other organisations. Where lawful and feasible, you should have the option of transacting with an organisation without identifying yourself. If personal information travels outside Victoria, your privacy protection should travel with it. This includes your racial or ethnic origin, political opinions and membership of political associations, religious or philosophical beliefs, membership of professional or trade associations or trade unions, sexual preferences or practices, and criminal record. The law puts special restrictions on its collection. For further information about the handling of personal information by the Law Library of Victoria please contact us via llv@courts.vic.gov.au. Contact information for the Office of the Victorian Privacy Commissioner can be found here. This information was last updated January 2019.